Last week, I noticed this trail heading along the back of the water facility at the end of Rubio. The trail heading out behind the water facility, photographed the week before. This trail looks to me like it gets a fair bit of use. I looked at the satellite photos to see where it might go, but couldn't be very sure from them. 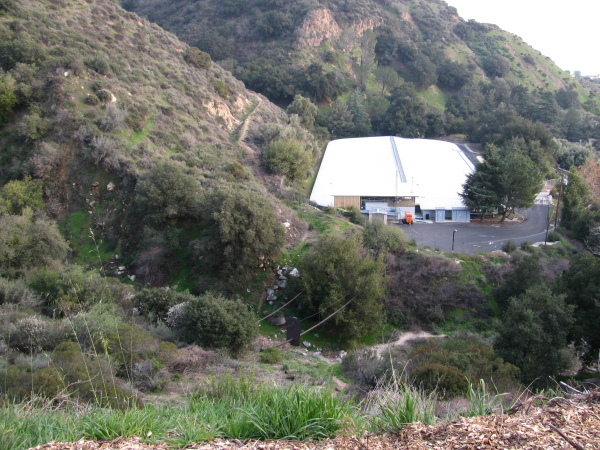 They did show that there is likely a mile or two of trail heading off around in the Eaton Canyon direction. It also showed a rather clear route down from the Rubio trail. I started as normal for Rubio, with the turning off Lake at Palm, then turning down everything that says Rubio on it and parking in the corner. I started down the trail as usual, watching for the trail down. There was a large dirt spot to the side of the trail as though people liked to stand out on that bit for the view, which so often is a good way to hide a trail junction. It turns out it was the junction I was looking for, so I headed down. The trail is little used but bears the markings of development and maintenance. Bush branches had been painted and cut at some point and the trail took a few short, but extant, switchbacks leading past a random abandoned mattress to a seeming campsite by the creek. 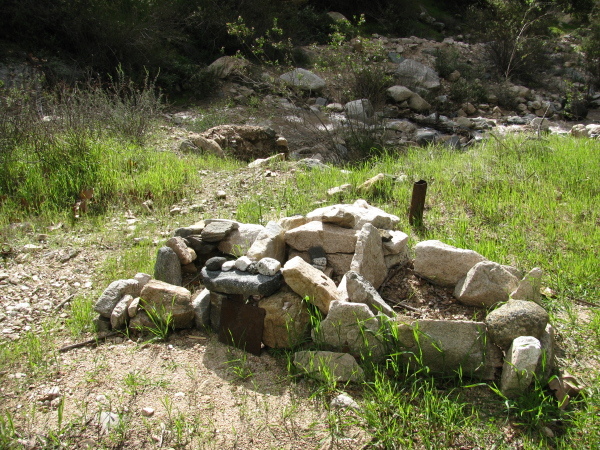 Stones set in three rectangles with a piece of an old camp stove at the bottom of the trail into Rubio. The pipe behind comes up from something buried.